Lincoln Tunnel to Route 3 West. Then follow additional instructions #1 and #2 below. George Washington Bridge to N.J. Turnpike 95 South to exit 16 West (Route 3 West) approximately one mile. Then follow additional instructions #1and #2 below. Via Route 17 South, approaching Route 3, follow signs for Route 17 South. Then follow additional instructions #1 and #2 below. Via Garden State Parkway South, to exit 153 (Route 3 East) approximately four miles. Then follow additional instruction #3 below. Via N.J. Turnpike, North to exit 16 West (Route 3 West), approximately one mile. Then follow additional instructions #1 and #2 below. Via Garden State Parkway, North to exit 153A (Route.3 East), approximately four miles. Then follow additional instruction #3 below. Route 80 East to Route 46 East, to Route 3 East, approximately five miles. Then follow additional instruction #3 below. #1 : Past Giant Stadium to Route 17 South. #2 : Follow exit to first traffic light (Quality Inn Motel). Left at light (Polito Avenue) to first corner, NAPCO is on Southeast corner. #3 : Go right at second exit marked Route 17 South-Lyndhurst (there are two exits marked Route 17 South, be sure to take second one). 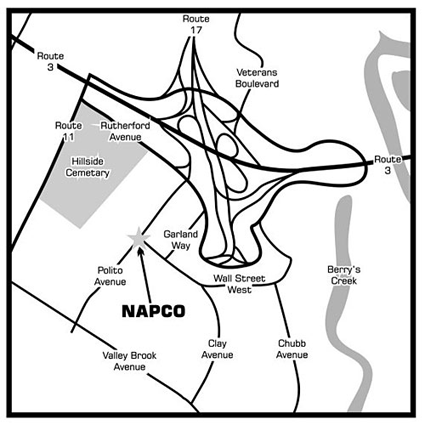 As you exit, go straight ahead, thru traffic light (along side of QUALITY INN MOTEL) to first intersection, NAPCO is on Southeast corner.